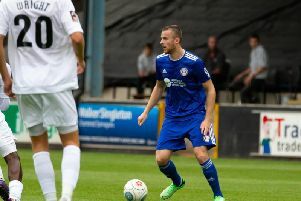 Town manager Billy Heath admitted his FC Halifax Town side were again well below-par after they salvaged a 1-1 draw in their FA Trophy third qualifying round tie at Matlock. Halifax went into the game on the back of a disappointing 4-2 defeat at Curzon Ashton, and didn’t improve on that display in Derbyshire, only managing to take the tie to a replay thanks to a late equaliser by substitute Alex Simmons after Matlock had deservedly led at half-time through Curtis Morrison. A disappointed Heath said afterwards: “It wasn’t great, we didn’t really play well again. “We didn’t pass the ball at all well. There wasn’t a lot of cohesion. “Matlock have had the better chances - Tom Nicholson has pulled off a great save in the first-half to stop us falling behind before they scored the goal. Heath felt his team suffered from a lack of confidence in the match. “I think we’ve got to get some confidence,” he said. “But we said before the game that one game against Curzon where we didn’t perform shouldn’t knock our confidence that much. “Look what we did 10 days ago (against Dagenham and Redbridge). But that’s the frailty sometimes, and now we’ve got to get the confidence back and get some cohesion back. Heath didn’t give up hope of an equaliser when it looked like Town’s defence of the competition they won back in May would end at the first hurdle. “I always thought we had a chance in us,” he said. “I was thinking ‘where is it coming from?’ at times, but I thought we would get a chance. “Simmons’ finish is just a great finish. We did our best not to give him the opportunity because we had two sets that we got wrong before it got set to him. “But the boys have got to get the confidence back. We can tell them but whatever their frailties at the minute, they’ve got to be strong and roll their slevves up and work hard. “We’re not great on the ball at the minute but they’ve got to get themselves through it. “This obsession with tactics people have in football - it’s not about that. Matlock played 4-4-2 - nothing out of this world. On the departure of striker Jordan Burrow to Gateshead that was confirmed the day before the game, Heath added: “Jordan has been fantastic since I came to the club. “His attitude has been first-class. “He wasn’t getting in the team regularly, which he craves. “When you score the amount of goals he scored last season, and you’re not getting in the starting 11, obviously the boy wanted to move on. “But when he was out of the side he did everything correctly and worked really hard whether he was in the side, on the bench or not involved in the squad.